Paws Vegas welcomes celebrities from all over including our Guest of Honour, Demicoeur! Demicoeur, a proud Canadian currently living abroad, will be a GOH for the second time in Canada (with the same honour previously bestowed upon her at Montreal’s What The Fur in 2011). She is a comic artist and illustrator who studied animation at Sheridan College. After deciding she sucked at animation, she started working on comics and has never looked back. 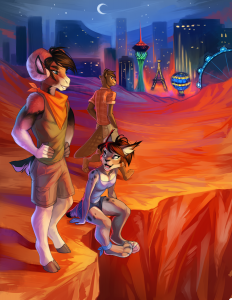 She writes and illustrates several furry comics, including “Cinderfrost”. In her spare time she enjoys gardening, gaming, reading, singing Disney tunes and travelling as much as possible. We look forward to welcoming her to Paws Vegas for Fur-Eh! 2018! We’re pleased to share two original works of art by our GOH for this year’s theme!